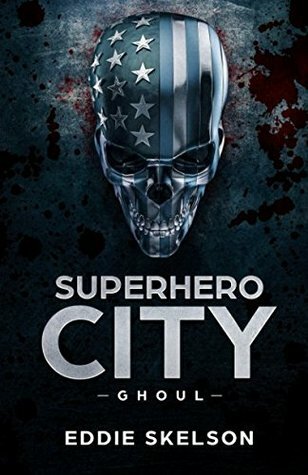 Superhero City: Ghoul is a fascinating look at superheroes in a corporate, capitalist America gone mad. It’s a world that’s all about the ratings and the merchandise. Heroes are picked for super teams, not by any skills or powers they might have, but on their bankability. At no point is this more clear than the fact that the prime super time, The Wild 5, needs a new member and instead of picking a black, homosexual Flash, they pick a hot latino teenager who can set her hands on fire. It’s all about the money. Kinda like what would probably happen if Michael Bay became the next president… which now I think about it is a terrifying prospect that could probably come true. Hero teams are accompanied by drones, conflicts are televised, and it’s all about getting people to subscribe to the next version of the platinum plus viewing package. If you haven’t guessed it yet, this is a super cynical look at what could happen if mutants (they’re called enhanced in the story) start popping up everywhere. It’s cynical, but not all together unrealistic. The author uses the medium of the Superhero genre to shed a damning light on the way the real world is moving. This is where The Running Man reference comes in. You should probably all read this book and also watch that film right now. We get a good range of PoV characters, including some heroes, some villains, and a scientist with an agenda that sits apart from the other characters. The characters are all a bit tropey at times, but that’s actually part of the point. This is a look at a world where people ARE boiled down to their tropes. My only real criticism with this is… they’re all so angry all the time. Every character is angry. All the time. It fits within the setting, but it’s a little bit tiring. The prose is good, with a slight over-reliance on infodumps to exposit about characters back stories, but the dumps are dropped in such a way that usually flows smoothly within the story. The book is short, a little slow paced at the start, but it picks up about half way through and from then on it’s relentless. So I’m giving Superhero City: Ghoul a well earned 4 stars. It’s a terrifying and damning look at where our world is headed, told through the lenses of a X-Men style superhero story. That sounds pretty awesome. I better check it out.